The original area of peatland in the Republic of Ireland and the number of sites of conservation importance are presented in the table below. * denotes figures taken from Hammond (1979). All peatland sites commonly form complexes with other habitat types. ** Some sites contain more than one peatland habitat type. Source: IPCC’s Peatland Sites Database 2009. The original extent of fens in the Republic of Ireland was 92,508ha (Hammond, 1979). IPCC monitors the status of the resource on an on going basis. The most serious impact on fens has been their reclamation for agricultural land which involves drainage, fertilisation, reclamation and removal of peat. As a result 77% have been lost to this use, leaving 20,912ha suitable for conservation. A number of these sites are secondary fens created by the activity of man. Examples of these are in cutaway bog areas, the margins of raised bogs, the Shannon callows and lake shores where water levels have been artificially lowered. More recent impacts are from enrichment, infilling and dumping, which can destroy a site or seriously degrade its quality. Fens are particularly sensitive to damage from these activities. 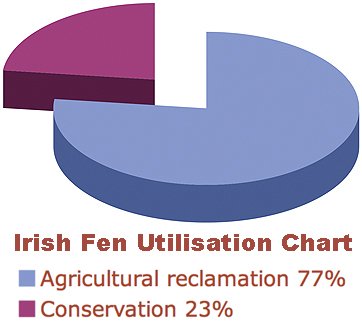 Utilisation of fen resources in the Republic of Ireland. Of the original area of 92,508ha of fens, 77% have been lost to agriculture and reclamation leaving 23% of the original area of conservation importance. Source: IPCC Peatland Sites Database 2009. The original extent of raised bog in the Republic of Ireland was 308,742ha. IPCC monitors the status of the resource on an on going basis. Developmental pressures on raised bogs are intense, particularly extraction for fuel and horticulture mainly due to the development of new markets for these products and the establishment of numerous peat producing businesses. The most serious impact of mechanised peat extraction in Ireland has been on the Midland raised bogs accounting for a loss of 24% of the resource in less than 50 years. Hand peat cutting accounts for a staggering 64% loss and afforestation accounts for 2% of the loss of habitat in the Republic of Ireland. This leaves 10% of the raised bogs remaining, which are deemed suitable for conservation. The utilisation of raised bog resources in the Rep. of Ireland. Of the original area of 308,742ha, 64% have been lost to turbary, 24% to mechanical extraction and 2% to forestry, leaving 10% intact and worthy of conservation. Source: IPCC Peatland Sites Database 2009. Originally 908,117ha of blanket bog covered the island of Ireland. 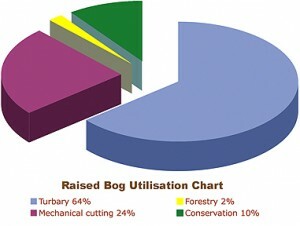 Although blanket bogs originally covered more than 774,367ha of the land surface in the Republic of Ireland (Hammond 1979), hand cutting over 400 years, the introduction of large-scale, mechanised turf extraction, afforestation programmes, intensification of agriculture and land reclamation have seriously depleted the area of blanket bog suitable for conservation. IPCC monitors the status of the resource on an on going basis. Today only 28% (216,599ha) of the blanket peatland resource remains in a relatively intact condition in the Republic of Ireland. Traditional cutting of the bogs for turbary is having a serious impact on blanket bogs. 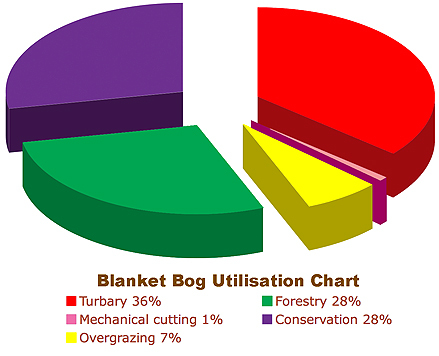 36% of the blanket bogs have been cutaway by this process (Hammond 1979, Ryan & Cross 1984). Peat is still being cut privately. Grazing pressure on blanket bogs although particularly severe during the last century (Doyle 1982) mainly by cattle did not result in degradation of this habitat. Sheep replaced cattle as the principal grazing animal with the introduction of EU farming subsidies in the 1980’s and have caused severe erosion and complete loss of sites. Overgrazing has led to erosion and habitat loss of 7% of the area of blanket bog since 1980 and in 2000 a further 7% was deemed threatened by this activity (EPA 2000). Large-scale afforestation schemes have had a huge impact on blanket bogs with planting on 28% of the original area within the Republic of Ireland (Ryan & Cross 1984). EU and Government incentives introduced since the mid 1990’s have resulted in an interest in wind energy developments which seriously degrade the integrity of mountain blanket bogs. Another cause of blanket bog degradation is the colonisation of the habitat by invasive alien species such as Rhododendron ponticum and Pinus contorta. Utilisation of blanket bog in the Rep. of Ireland. Of the original area of 774,367ha, 7% of the blanket bogs have been lost to overgrazing, 36% to turbary, 1% to mechanical extraction and 28% to afforestation leaving 28% intact and worthy of conservation. Source: IPCC Peatland Sites Database 2009.